Last Tuesday night, while driving west on Sunset from Los Feliz through Hollywood, en route to see Magnolia Electric Co. open for Son Volt, I listened to The Pixies debut EP Come On Pilgrim, in it’s entirety, for the first time in years. I was consumed by it, and listened again, twice, on the way back home. 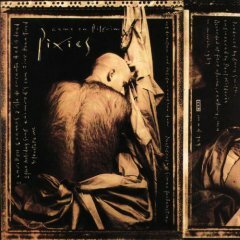 If I was reminded of anything, it is that Come On Pilgrim, Surfer Rosa, and Doolittle make up up a triumverate unmatched by The Pixies latter (while still very good) efforts. Bossanova and Trompe Le Monde certainly have their moments, not to mention, a place in my heart, but these original three releases document a band at their creative zenith carving out a sound in the late 1980s all their own. Below: Listen to “Ed Is Dead” off Come On Pilgrim and note Joey Santiago’s guitar sound and tone. It helped define the Pixies, and still sounds remarkably the same with his current band The Martinis, today. The first Pixies record I ever heard was Trompe Le Monde, and I nearly gave up on them right then. Couldn’t understand what the big deal was. Luckily, I stumbled onto the older stuff a year or two later. Amazing then, amazing now – and I concur, while the later stuff was good, the first 3 recordings (especially Come on Pilgrim and Surfer Rosa) are almost essential. When I think back to when I first started obsessively listening to the pixies, I think of high school. was that music the greatest or what? Nothing like a lazy sunday and pulling those old tapes out… I love going into the coffee shop when the teenage hipsters behind the counter are playing my high school soundtrack like they’ve discovered a secret. Great album from a great band. I’m obviously most partial to Surfer Rosa and Doolittle (like probably everybody else) but Come On Pilgrim is definitely interesting to see how much they evolved in such a short span. And in its own right, its an awesome listen. Nice post. Strangely enough, my two favorite Pixies records are Come On Pilgrim and Trompe le Monde. Surfer Rosa is great, Doolittle is just as great but overplayed, and I can’t sit through Bossanova anymore. I love the raw energy of Pilgrim, and I hear certain elements of that in Trompe, actually. But I’m digressing… nice post. I saw the pixies in 87-88 in boston and that two guitar attack and just the raw emotion of black francis was nearly too much to handle, the only other band that had such an impact on me at the time was another boston band and label mates – Throwing Muses. Seeing these groups play the dark, dank “club” the rathskellar as a late teen was one of my greatest musical moments. Always great to hear them again. Oh yeah I’d throw the Boston band The Zulus in that mix as well, although they never made it….